This ontology provides a description of the data lifecycle for enterprise information processing. It models both the data and the software lifecycle on the example of the JURION platform. Furthermore, it supports different kinds of entities, users, and versioning. The purpose of the Enterprise Information Processing Domain-specific Meta-Model is to provide a set of concrete entities, agents, activities, and roles to represent the data engineering process. It is based on the general Data Lifecycle Ontology. The initial information gathered to build the domain-specific enterprise information processing metamodel is based on the JURION use case. The JURION use case includes both processes for data and software development and therefore uses the data lifecycle ontology and the software lifecycle ontology. The ontology models mandatory data requirements for specific processes and checks if they are fulfilled. The location of error occurence within the process is registered and the type of error or incosistency asserted. Furthermore, we capture how many errors occured, in which dataset they were detected, what was responsible for it, who fixed it, when was it fix, and how long does fixing take. Captured information about the dataset include publishing, versioning, and properties. Functionalities are associated to specific datasets and changing of data is tracked. Other areas of interest are links and how they behave especially when linking eternal data sources as well as mapping ontologies and information of processes about external data changes. This ontology imports the W3C PROV ontology available at http://www.w3c.org/TR/prov-o/. It is derived from the Data Lifecycle Ontology available at http://aligned-project.eu/ontologies/dlo. Person who is an expert in development and management of content management systems. Person responsible for the content of a software system. A controlled vocabulary process outcome. Person who is involved in requirement engineering and usage of the software or data product. Generation of data as a data lifecycle process. The data source for a specific kind of data. A bug report in a software system. Person who is an expert for legal issues in a certain domain. Person who edits legal documents for a software or data system. Person who owns and uses the end product. A requirements document as output of requirements engineering. 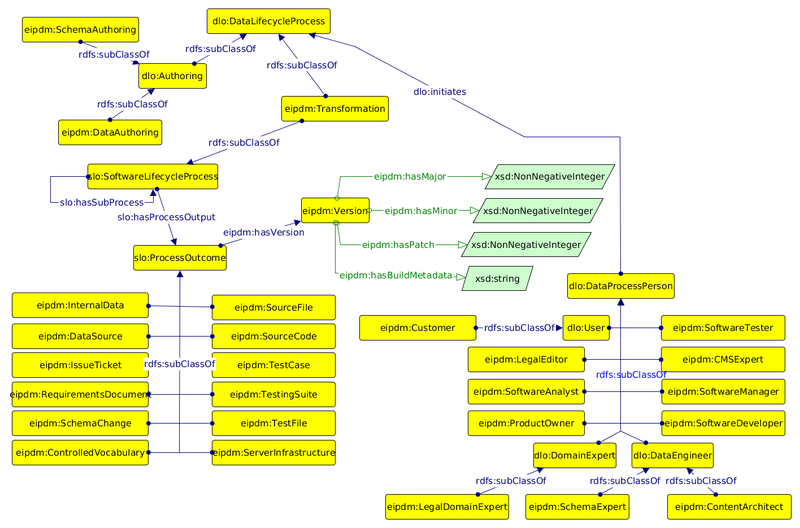 Creation of a schema as a data lifecycle process. A document describing the change of schema for a sofware or data system. Person who is an expert in development of schemas for a data system. The server infrastructure on which a software or data system is deployed. Person responsible for analysing software systems and requirements engineering. Person responsible for development of software systems. Person responsible for management of software engineering projects. Person responsible for testing software systems before releases. An unspecified amount (collection) of source code in a specific programming language. A source file containing source code in a specific programming language. A test case which tests one specific aspect of a software system. A file containing test suites and/or test cases for a software system. A collection of test cases for a software system. Transformation is a data and software lifecycle process which is the base class for several subprocesses for changing data or software artefacts. Versioning model according to Semantic Versioning (http://semver.org/). Build meta-data as string is a place for potential future growth of the model, depending on use cases.